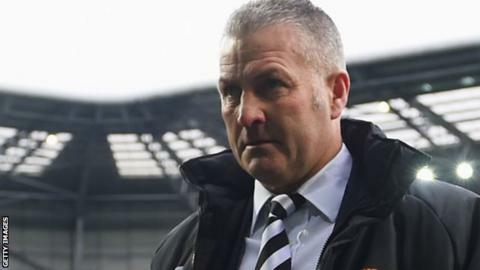 Wrexham manager Gary Mills could add two more players to his squad ahead of Saturday's opening National League game of the season at Bromley. Mills revealed a goalkeeper and midfielder are training with the Dragons this week. "It totally came out of the blue where two players that I know of have become available," Mills said. "They do fit in with my budget so if I like what I see then possibly they might be joining us." Midfielder Joel Logan became Wrexham's 12th summer signing, joining on a month's loan from Rochdale. Stoke City defender Mason Watkins-Clark has also joined the Welsh club on a one-month loan. James Gray, Adam Smith, Kayden Jackson, Cameron Belford, Jamal Fyfield, Adriano Moke, Dominic Vose, Sean Newton, Javan Vidal and Lee Fowler have also signed. Mills, who succeeded Kevin Wilkin at the Racecourse in April, has been pleased with the squad's progress during pre-season. "We've had time to settle in together. We haven't brought players in late on so they've got to get to know each other," Mills added.